Ever wonder how these cells communicate, and what this may have to do with mental health and brain health? This is where “neurotransmitters” come in. They are “brain chemicals” made from protein. Neurotransmitters do exactly that – they transmit information between nerve cells. They help our neurons “talk” to each other. FUN FACT: Nerve cells are called “neurons.” Our nervous system has other types of cells as well. We have billions of neurons in our body. About 100 billion of them are in our brains, and there are billions more in our spinal cords and the rest of our bodies. Neurons relay messages from our brain and spinal cord (central nervous system) to our big toes, everywhere else in our bodies, and all the way back. This is why the research into neurotransmitters is so very important when it comes to brain and mental health! Neurons use both electrical and chemical signals to transmit messages. A neuron is a nerve cell with a long tail-like end called a “dendrite.” When it gets a message, it sends the signal from one end of the tail all the way down to the other end of the cell via electricity. But, it can’t send it’s electrical signal through to its neighbouring neuron. To send that message over, it communicates with its neighbouring neuron by neurotransmitters. Here’s how it works: Think of the game “hot potato” where people are in a line or a circle beside each other. The first person gets the “hot potato” and needs to pass it to their neighbour. This has to continue as quickly as possible until the potato gets to the right place. In real life, a neuron gets a signal, say you touch something hot. Let’s consider this “hot” signal the “hot potato.” That neuron in your finger gets the message and needs to quickly send it through the communication network all the way to the spinal cord or brain. It first sends the signal as an electrical signal through its “tail” all the way to its other end. Think of this as the first person holding the potato and turning toward their neighbour while still holding the potato. In your neurons this is done electrically, so while the potato is in someone’s hands it’s like the electrical signal going from one side to the other. But that one neuron doesn’t reach all the way where the signal needs to go – it needs to get to your spinal cord or brain. So, it has to relay that signal to its neighbouring neuron. Here’s where it passes the “potato” to the neighbour. But the problem is that it can’t pass the electricity. So, it has to change that signal into a chemical to get to the neighbouring cell. This is where neurotransmitters come in. This neurotransmitter goes through the tiny space between the two cells called a “synapse.” When that neurotransmitter reaches that neighbouring neuron it attaches to a “receptor.” That receptor is the neighbour’s hands that catch that “hot potato.” When that neurotransmitter gets to that second cell, it then changes the chemical signal back into an electrical one. This electrical-chemical communication happens really quickly and continues until the message gets to where it needs to go. From your fingertip up to your spinal cord or brain where a super-quick decision is made. Then another signal goes back down to your finger to move the muscles to quickly pull it away from the pain. This is how our nervous system is the master communication system of the body! It’s how our brain knows if it should be awake (because of the light your eyes see), whether you’re too hot (and need to sweat to cool off), or whether you’re in danger (and need to “fight or flee”). There are many different neurotransmitters, at least 200 have been identified. Let’s look at three key ones, and what we know so far about their roles in stress and moods. Serotonin, also known as 5-hydroxytryptamine (5-HT), has many roles in the nervous system. It’s involved with maintaining our body temperature and is transformed into melatonin to help us get sleepy when the light starts to dim. It’s also important for our memory, our stress response, as well as processing our emotions. Serotonin is made from the amino acid (one of the building blocks of protein) tryptophan. Because of its role in mental health, many medications for depression target the serotonin that is produced in the brain. Some serotonin is made in the brain, but most of it is actually made in the gut. One of serotonin’s roles in the gut is to help our gut keep food moving through it (“gastric motility”). Researchers are looking into the roles of the serotonin produced in the gut – at this point it’s unclear whether the serotonin made in the gut travels to or affects the brain. But, it is still important to support gut health for good mental health. Norepinephrine (NE) is a neurotransmitter released in brain and is involved in the stress response. The part of our nervous system that is activated when we’re stressed and when we feel anxious results in a rapid release of norepinephrine in the brain. It’s a huge part of our “fight or flight” reaction. Norepinephrine also helps maintain overall alertness and increases in the morning to help us feel more awake. Norepinephrine is made from the third neurotransmitter we’re talking about, dopamine. Dopamine (DA) is the “motivation” neurotransmitter – it helps us to seek reward. Dopamine helps to turn our enjoyment of a reward into the desire to go out and get that reward. In this way it’s thought that dopamine helps to shape behaviour. Some medications used to treat behavioural disorders work by changing how dopamine acts in the brain. This “motivation” role of dopamine is also involved in our moods. For example, when dopamine levels are low, we can experience “anhedonia” which is when we lose our motivation to seek out reward. Dopamine has other roles in brain and nervous system communication too. It’s important for working memory and mental flexibility. It also helps to control our movement. For example, when certain parts of the brain don’t have enough dopamine, it can result in the muscular rigidity of Parkinson’s disease. Stress is anything that challenges our body’s ability to maintain optimal health and have all of our systems balanced. This goes for mental health (psychological stress) as well as physical stress (i.e. exercise and/or being cold). Stress also contributes to inflammation, which has a negative effect on mental health. Our natural physical and mental reactions to stress are for our own survival. Psychological stress can trigger our brain to react to danger. And our “fight or flight” response happens whether we’re scared because we’re on a roller coaster, whether we almost got in a car accident, or whether we’re overworked and worried about our jobs. These are all examples of psychological stress, and they all cause the same response in the brain and the body. Depression and anxiety are some of the most common mental health concerns in the world. Many people experience both, and women are more likely than men to be diagnosed. In the next 13 years, depression may become the leading cause of disability in the United States. Depression involves a persistent feeling of sadness and loss of interest, empty, or irritable mood that can significantly affect someone’s ability to function. Sometimes there are sleep issues, lack of energy, and effects on appetite, and anhedonia (a lack of motivation to seek out things that used to interest us or make us happy). Depression affects how someone feels, thinks, and behaves. The symptoms might differ from person to person. NOTE: If you think you may have depression, anxiety, or any brain or mental health concern, please see your licensed healthcare professional. The causes of depression seem to be very complex, with many possible reasons that are unique to each individual. Reasons like genetics, hormones, stress and emotional loss may all contribute to the risk of depression. A lot of research has looked at the structure and function of the brain to understand how it controls mood and emotions. 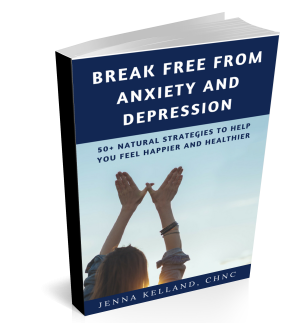 One of the most popular ideas that started in the 1950s relates to neurotransmitters and the hypothesis that a deficiency in the “happy” neurotransmitter serotonin (5-HT) and the “stress” neurotransmitter norepinephrine (NE) are one reason for depression. Over the years, a possible role of dopamine has been added to this concept of depression. When it comes to serotonin, it’s thought that not having enough serotonin in the right spots is one of the contributors to depression. Because of its role in mood, many medications for depression target this neurotransmitter. Some newer medications also target norepinephrine and/or dopamine. The fact that there are multiple factors that contribute to depression is supported by the fact that some people benefit from these medications, but others do not get better. Neurotransmitters are made from amino acids, which are the building blocks of protein. So, is there any evidence that eating more of or supplementing with these amino acids helps to improve brain or mental health? Theoretically, this makes sense, however the evidence is fairly weak. NOTE: Always heed the label and speak with your doctor or pharmacist before taking supplements if you have a condition or are taking medications, as they can have negative side effects. Many foods contain the amino acid tryptophan: eggs, tofu/soy, sesame and sunflower seeds, spirulina, and cod. Ideally you would get enough of all of your essential amino acids from food. There isn’t any good evidence that eating more foods containing tryptophan directly helps with brain and or mental health, but making sure you eat enough protein and healthy fat can ensure you have the building blocks to make serotonin and other neurotransmitters, and ensure your neurons function properly. One supplement sometimes recommended to increase serotonin is 5-HTP. Tryptophan (the amino acid) is converted into 5-HTP which is then converted into serotonin (5-HT). Theoretically, 5-HTP or tryptophan supplements should be effective at helping with moods. There has been research on this topic, and it shows promise, but 5-HTP is not proven to help with symptoms of depression. Results are small, even in people who are deficient in tryptophan. While a couple of small studies looked at the use of 5-HTP for anxiety, and only one found a benefit – and that benefit was small. NOTE: 5-HTP has not been found to improve mental health symptoms and likely interacts with medications used for those conditions. It may also reduce the activity of dopamine. Always heed the label and speak with your doctor or pharmacist before taking supplements. Foods and Supplements for Norepinephrine and Dopamine? If both norepinephrine and dopamine are made from the amino acid tyrosine, is there evidence that foods or supplements high in tyrosine can help with these two neurotransmitters? Many foods contain the amino acid tyrosine: eggs, tofu/soy, spirulina, parmesan and romano cheese, peanuts, cod, and sesame seeds. As with tryptophan, ideally you would get enough of all of your essential amino acids from food. Also as with tryptophan, the answer is that eating more of these foods probably doesn’t have a huge effect on levels of norepinephrine or dopamine. Studies show that increasing the amount of tyrosine in the body does not result in increased levels of norepinephrine, or dopamine, nor does it directly help with brain and/or mental health symptoms. L-tyrosine supplements may be useful if there is a deficiency in l-tyrosine; however, if there is no deficiency is doesn’t provide any benefits. Taking l-tyrosine supplements does not seem to increase production of the neurotransmitters. L-tyrosine may slightly improve cognition and reduce memory loss during short-term physical stress. It’s unclear whether it helps with normal (non-stressed) memory, or long-term stress or fatigue. Even though there is only limited evidence that food and amino acid supplements impact your neurotransmitters, what you eat still makes a difference in your mood and energy. Your food choice can reduce inflammation, support your gut health and balance your blood sugar, which all help improve mental health. But, there is something that CAN help with brain health, mental health, and neurotransmitters! Back in 1969, a researcher named Morgan found that physically unfit people were more depressed than “fit” people. This study was the first to look at the links between exercise and mental health. It was groundbreaking at the time and sparked decades of research. We’re learning more and more about the effects physical exercise has on the functions of our brains and our moods. Regular exercise reduces symptoms or slows progression of stress, depression, anxiety, dementia, Alzheimer’s, Parkinson’s, and autism. Some studies show that, for certain types of depression, regular exercise may be as effective as medication or psychological therapy. Both strength training and aerobic training have been shown to have positive effects on people with depression. Some researchers say that moderate-intensity aerobic training and high-intensity strength training may be the most effective exercises to provide positive mental and brain health benefits. If exercise can help with brain and mental health, what does this have to do with neurotransmitters? Regular exercise can protect the nervous system and increase metabolism, oxygenation, and blood flow to the brain. Exercise also improves our mood by activating certain areas of the brain, and induces the release of neurotransmitters and other brain chemicals. These chemicals can motivate us to continue to exercise regularly, helps to stimulate new neurons, and can result in improved neuroplasticity (the ability of the brain to change itself). People who exercise tend to have lower levels of the stress hormone cortisol than sedentary people. All of these are positive for both brain health and mental health. In rodents, certain parts of the brain have higher levels of serotonin after exercise. And frequent exercise increases the amount of serotonin produced and used in the brain. Similarly with dopamine – exercise increases dopamine levels in different parts of animal brains. If you’ve ever felt that exercise helps with your mood and memory, this may be partly due to the effect it has on dopamine. While regular exercise can promote mental health. Excessive exercise and overtraining, on the other hand, can have adverse effects. If there is a lot of pressure to perform well, this can be detrimental to mental health, and has been seen among elite athletes. Eating and supplementing with key amino acids may not do much, but something else does: regular exercise! Have you found that exercise helps to boost your mood and improve your memory? What exercises do you find work best for you?